What is Lionheart Personal Training? 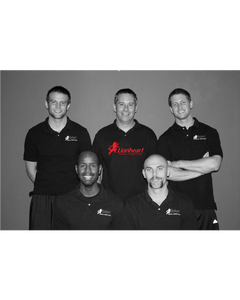 Lionheart Personal Training has been a family owned business since 2006. At our unique facility EVERY TRAINER IS AN OWNER. It is our goal to bring inexpensive, quality, personalized fitness programs to every individual who truly wants to improve his or herself. We serve all aspects of our community from the Baby Boomer to the little leaguer; from the novice just trying to get fit; to the high school and college athlete trying to hone his or her speed, power, agility and strength. It is our desire to help you become a better you. At Lionheart, you’ll not only get a great workout, but you’ll also get a great education. As former coaches and teachers, the staff goes above and beyond to make sure each client understands the ABCs of fitness, so you leave each session armed with the knowledge to maintain a healthy lifestyle. The welcoming feeling is reinforced by the positive, upbeat vibe of the staff who makes even the most apprehensive first-timer feel instantly at ease. at Columbia and St. Louis, as well as Webster University, Lindenwood, and UMKC. At Lionheart Personal Training we put you first. We want you to succeed and we know with our help you will ! Contact us today for an immediate appointment !